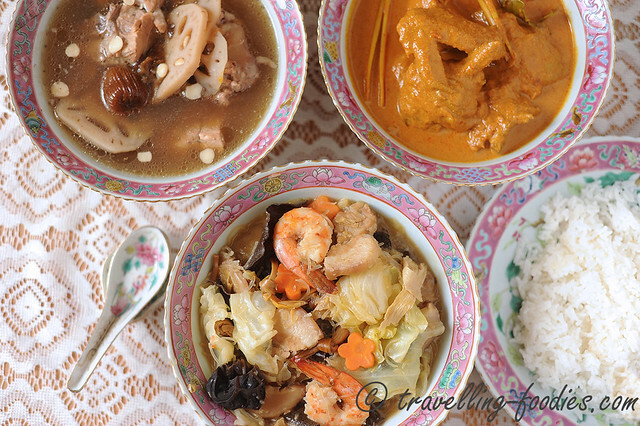 There are several things that set the Peranakan chap chye apart from the mainstream Chinese versions. Firstly, the Chinese versions are largely vegetarian, void of meat and even garlic, unlike the Straits Chinese version where sliced pork belly and prawns are added. Next is of course the addition of fermented soya bean paste aka taucheo while the Cantonese version uses fermented red yeast beancurd aka nam yue instead. If you can’t find taucheo where you are, I think miso paste is a reasonable substitute. Apart from the above mentioned, the other ingredients in the Peranakan Chap Chye is pretty much the same as those of the Chinese vegetarian versions. 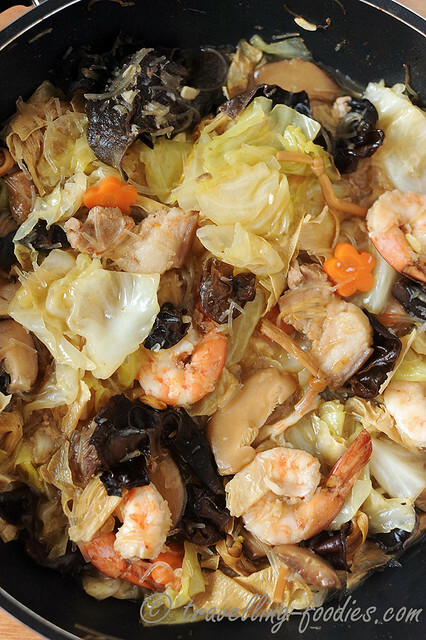 Chinese cabbage aka kobis or khor leh chye is the main ingredient for the dish with the other accompanying condiments like carrots, dried lily bud (kim chiam), dried chinese mushrooms (hnio khor), dried black fungus (bok jee), fried beancurd stick (tau kee aka teck ark kee) and dried mung bean vermicelli (tang hoon). What is missing from the spread in the photograph above is dried sweet bean curd sticks (tnee tau kee aka tnee teck ark kee). Do remember to retain the mushroom soaking water as it contains so much flavour. That said, do give the mushrooms a good rinse before allowing them to reconstitute in water for a couple of hours. I usually soak mine overnight in the fridge. When fresh prawns are not used, my grandma would add dried shrimp (udang kering) instead for that additional dimension of umami flavours. For special occasions, the fresh pork belly would be replaced with roasted pork belly (sio bak) instead and sometimes, dried fish maw (hee pio) or sea cucumber (hai sim) was added as well. The actual cooking time depends on how soft one likes his or her chap chye to be. Some of my cousins prefer the cabbage to be crunchy while the older folks like my aunts like the ingredients really soft and mushy. Whichever the case is with the texture, the more important step is to allow the cooked chap chye to sit for at least a couple of hours before serving, or preferably overnight for the flavours to develop. And whatever chap chye is left behind is not wasted, cooked together with the other food on the table like roast chicken or duck and whatever soup that was cooked that day, like Itek Tim, Kuah Hee Pio or Kuah Perot Babi and it would be instantaneously transformed to a delicious chye boey tng! Soak dried mushrooms, black fungus, dried lily bud separately til soft. Retaining soaking liquids of mushrooms. Chunk cabbage and carrot into bitesize pieces and set aside. Halve soaked mushrooms into bitesize pieces. Quarter if mushrooms used are big. Cut black fungus into bitesize pieces. Cut off the hard stem at the end of each lily bud and tie each lily bud into a knot. Peel prawns to remove shell and head. Set exoskeleton aside for later use to make the prawn stock. If the taucheo used is in whole grains, mash preserved soya beans coarsely in a small bowl with the back of a spoon and set aside.Omit if taucheo paste is used. Break dried beancurd skin sheets into bitesize pieces. Using a pair of scissors, snip sweet beancurd skin sticks into 1-cm wide strips. Peel and mince garlic finely. Cut pork belly into narrow strips. First, prepare prawn stock with prawn exoskeleton as in the laksa lemak recipe here. Discard the spent exoskeletons and set aside the stock for later use. Heat up the same wok and add more cooking oil. And turn down flame to medium low. Add dried beancurd skin sheets and slowly fry until they crisp and blister slightly. Remove, drain to remove excess oil and set aside. Repeat frying process with sweet beancurd sticks which had been cut into strips. Fry until crisp and surface begins to blister. Do not overfry these as they would become too brown aesthetically and bitter to taste. Remove, drain to remove excess oil and set aside. Pour away most of the frying oil until about 2 tbsps left. Add garlic and dried shrimp if using, and stir fry until it exudes aroma. Add pork belly strips followed by taucheo paste and stir-fry, followed by carrots, cabbage chunks until well-coated. 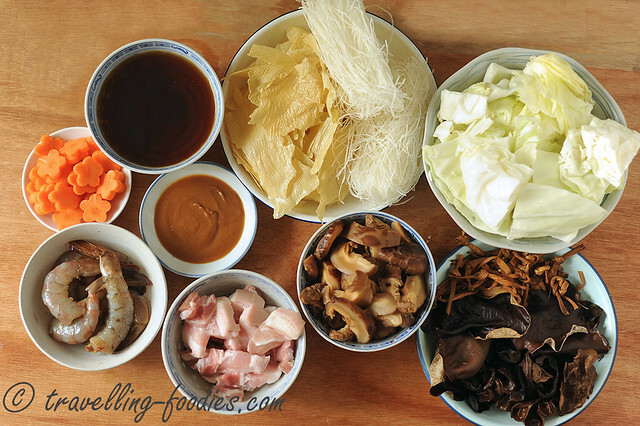 Add black fungus, Chinese mushroom, lily buds, the two types of beancurd sticks, any of the optional ingredients mushroom and stir fry a bit. Pour in mushroom soaking liquids, pork stock, prawn stock and top up with enough water to almost cover all the ingredients. Bring everything to a boil. Lower flame to a simmer for 20-30 min covered. Open the lid every 10 min or so to give all the ingredients a good stir. Finally add the mung bean vermicelli and continue to stir for another 5-8 min until the stock reduces and the tang hoon is well reconstituted. Mix the ingredients with spatula until everything is well incorporated. Top up with water if necessary. Cover with lid and allow to simmer until cabbage and carrots soften to the desired texture. Adjust the flavours with salt and sugar if necessary. Turn off flame and allow the cooked chap chye to sit for a couple of hours, and preferably overnight for flavours to develop. Reheat the chap chye an hour or so before serving, but serve while it is lukewarm or even at room temperature. 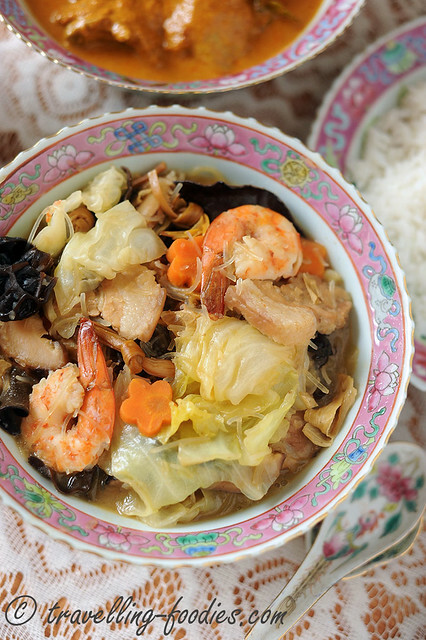 The flavours of chap chye are best appreciated when it has returned to room temperature. 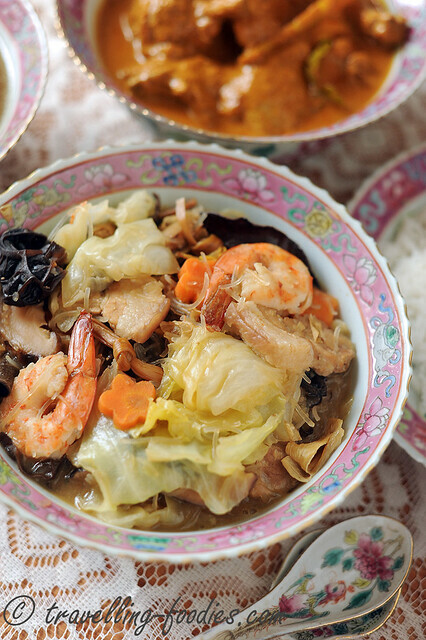 Serve alongside other Peranakan dishes with steamed rice and sambal belacan. This entry was posted on October 7, 2015 by Alan (travellingfoodies). 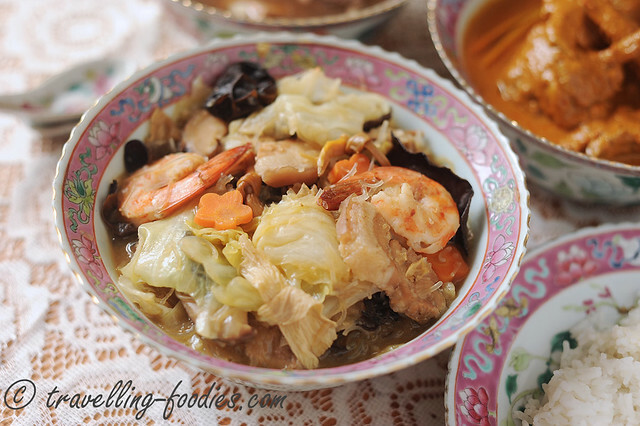 It was filed under Food, Simple Eats and was tagged with Baba, black fungus, bok jee, cabbage, carrot, chap chye, chinese mushrooms, dried lily bud, fermented soya bean paste, fried beancurd skin, kobis, Nonya, Nyonya, Peranakan, pork belly, prawns, stewed vegetables, straits chinese, taucheo, udang.